BUT - - what IF, time and maturity and patience and LOTS of modern technology have made some drastic changes .. and you now could say Red Heart and Soft and Fuzzy in the same sentence? I'd like to introduce you this morning to just such a possibility! 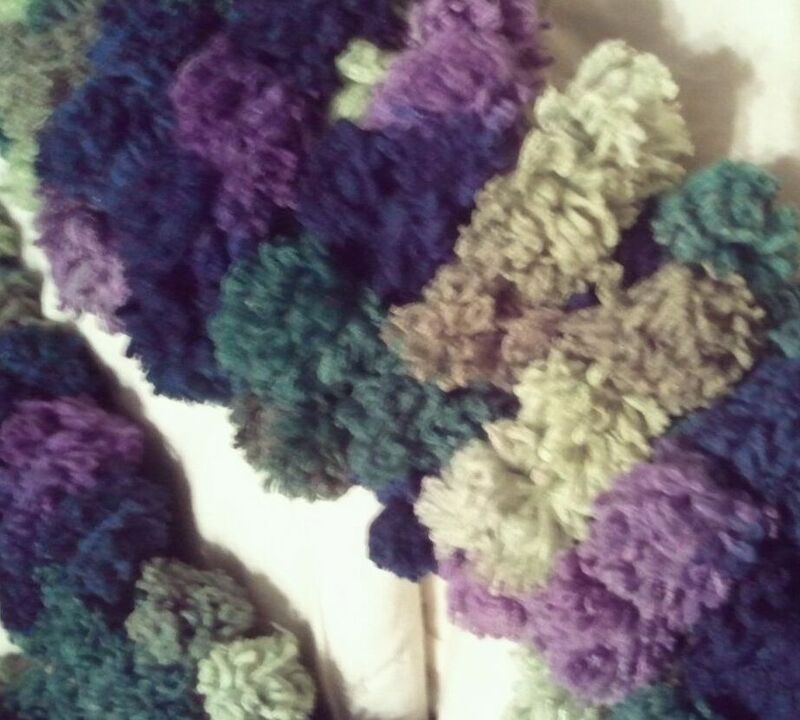 A Fun, Quick & Easy project that has as much therapeutic value for the Knitter And the Wearer! Meet Pomp-a-Doodle! This soft, fuzzy little yarn is nothing more than fluffy, baby sized pompoms on a string ... with all the knitting occuring in between the pompoms ... and you are left is a necklace of clover flowers. Remember stringing them together as child? Now, you can do it again with your needles! 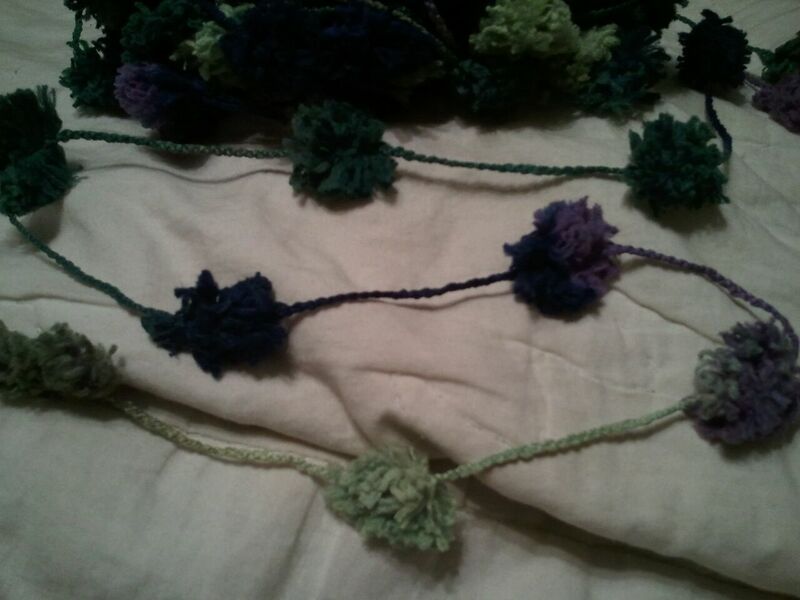 i purchased 2 skeins of "African Violet" and cast on 8 stitches using the backwards loop method so that it would be a bit looser and easier to work with. Using the chain that connects these little fluffy poofs, you work 2 stitches in between each pompom and knit to the end of the row, turn and repeat. I also used a size 8 needle just to keep the fudge-ability (yes, it's a word!) a bit easier to work with. I found this yarn at several of the local craft stores around town, and it retailed for $5.99, but with coupons and discounts i think i spent around $3 for each one. 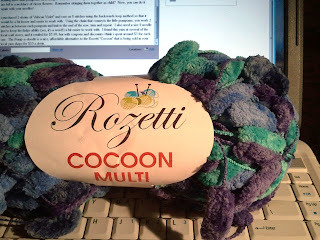 The Pomp-a-Doodle is a nice and affordable alternative to the Rozetti "Cocoon" that is the rage right now in your local yarn shops. 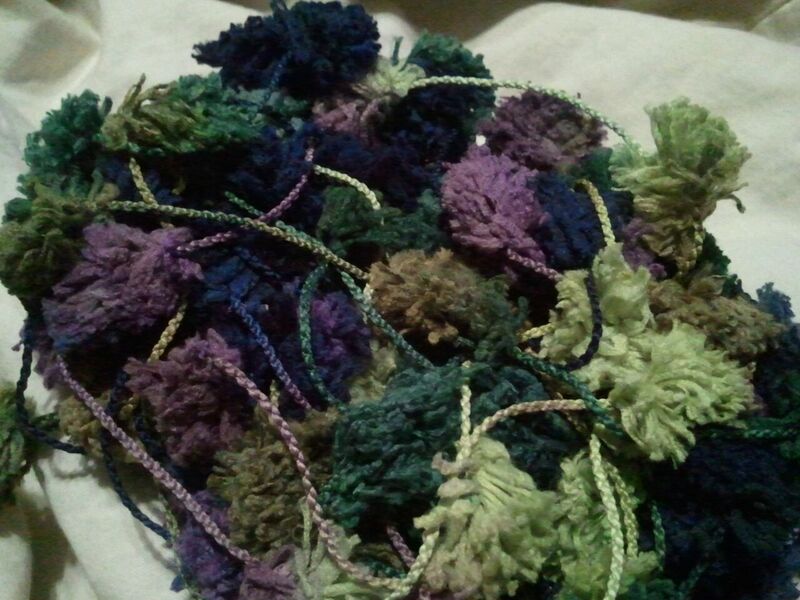 It is retailing for around $10 a skein, and the puffs are more like Cheetos instead of cotton balls. Either way, both of these yarns are a fun little "happy" to throw into the midst of some of the knitting that we do that requires more concentration. THIS is definitely a talk-and-knit at the same time project! and you won't believe all the people that will stop and ask "what ARE you working on?" .. it's a great way to introduce them to the joys of knitting! i really like it when others notice what i'm doing, and will stop long enough to allow their inquisitive nature to be satisfied for the moment. 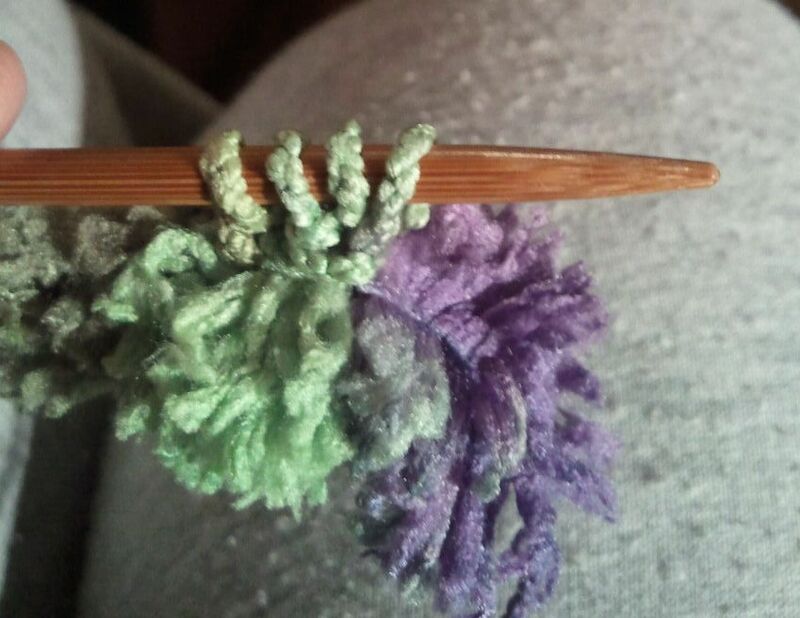 Knitting has become a great ice breaker and way to meet new friends, listen to their stories and even invite them to church, where - in days gone by- we had time to sit and knit as a group! i really miss those days of fellowship and yet there is a special bond that still exists between that group of ladies . . seems like our string and needles STILL connect us and we share yarn and projects and coupons and books every time we see one another. The kinship and sisterhood that has grown from this commonality is rooted not only in our needles, but in our faith. Is it exclusive? Heavens NO! 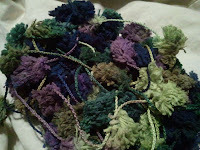 and to think that there would ever be a group of knitters with locked doors and pass words makes me sad to even ponder! When you have something in your life that makes you smile from the inside out you HAVE to share it! For me, it's my knitting and my music .. and my faith! How i pray that the things i say and do will cause others to ponder on my 'motivation' ... why DO i respond in such a way? Why DON'T i do 'thus and such'? How CAN you believe in things you don't see, touch or can explain? Lots of questions perhaps ... but lots of Peace that can only be explained by a relationship with the Father. Do i mess up? YES! Do i let Him down? ALL THE TIME! Do i fall short and probably leave messes behind that only He can clean up? NO DOUBT ABOUT IT! Nonetheless, the commitment of my heart to Him is the driving force for all that i long to do ... and even on those days when nothing goes right, or i've made the biggest mess ever, i realize that He is the King of Frogging! and He can take my scratchy acrylic, ugly colored days of tangled yarn and with His touch, transform it into a beautiful little string of pompoms that remind me that time Can and Does bring change .. and work together for His good, even when i don't understand it all! I have told you thses things, so that in Me you may have peace.